There are hundreds of different types of breads made and eaten in all parts of the world. One such type of bread is banana bread, which is extremely delicious and once you taste it, you would surely want to have it again. This bread is not very common in most regions of the globe, despite the fact that it is extremely easy to make. The first step towards making banana bread is to preheat the oven to 350 degrees F or 175 degrees C.
You should now mash three or four ripe bananas nicely in a large mixing bowl before mixing butter in it with the help of a wooden spoon. Stir the spoon in the mixture for about a minute to ensure that bananas and butter are thoroughly mixed and a nice consistency is achieved. Once you have ensured that butter is properly mixed with mashed bananas, you can add other ingredients like sugar, egg and vanilla. Sprinkle salt and baking soda over the mixture before mixing it well once again. Once you have added all the ingredients, you can add the flour and stir the mixture with the spoon again. Grab a four into eight inch loaf pan and spread some butter on it before you pour in the mixture. You should now put the pan in the oven and let the mixture to get baked for one hour. Once done, take the pan out of the oven and allow it to cool on a rack for a few minutes. 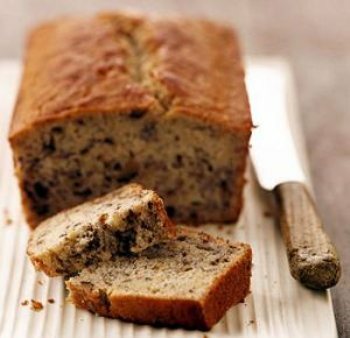 You can remove the banana bread from the pan and serve it after slicing.